Devine Healer Fr. Corsie Legaspi (far right) enters the Assumption church. 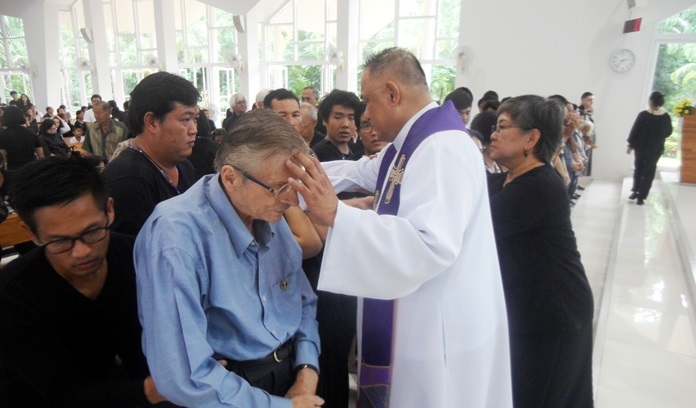 Crowds of ailing Catholics crowded again into Church of the Assumption as a Filipino priest and “healer” made his annual pilgrimage to Pattaya. Rev. 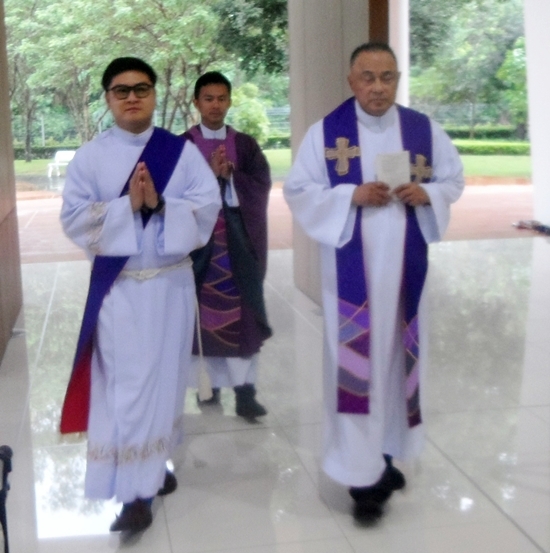 Corsie Legaspi from the Our Lady of the Rosary Parish in Rosario, Cavite held his healing ceremony and mass Oct. 13. Parishioners with everything from cancerous tumors to sore limbs turned out, looking for a miracle. 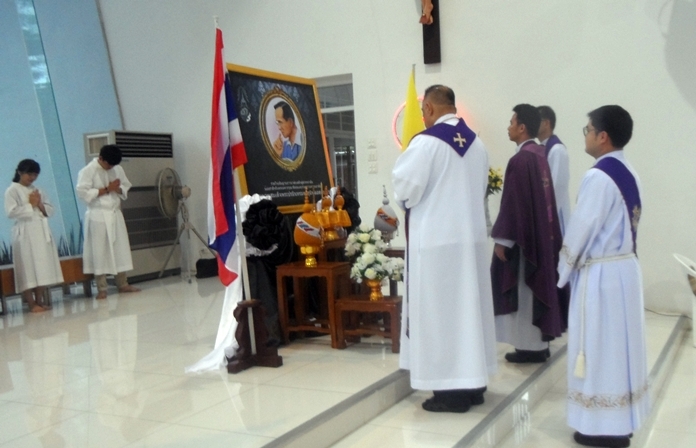 The resident and visiting priests hold a minute’s silence for King Rama IX. “I am only the pen held by God with which he is writing on a piece of paper,” he told the congregation. They all waited to be touched by the priest who placed his hands on the foreheads of cancer patients first. Some fainted and were caught by helpers to place them on the floor until they revived. After that he tended to those people with disabled arms and shoulders. He touched them and stretched their arms, encouraging to do it themselves, which many found they could. 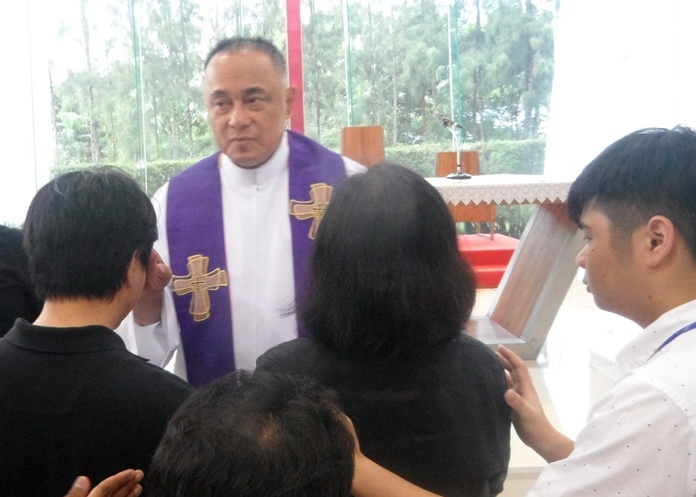 Legaspi believes he obtained his ability in 1975 after a Charismatics prayer meeting when people collapsed after he touched them during prayer. He purports that after a subsequent lengthy prayer his mother, terminally ill with lung cancer, awoke from her comatose state to walk again. He’s traveled the world ever since hosting healing ceremonies. Fr. Corsie lays hands on those seeking a healing experience. Devine Healer Fr. Corsie Legaspi enters the Assumption church. 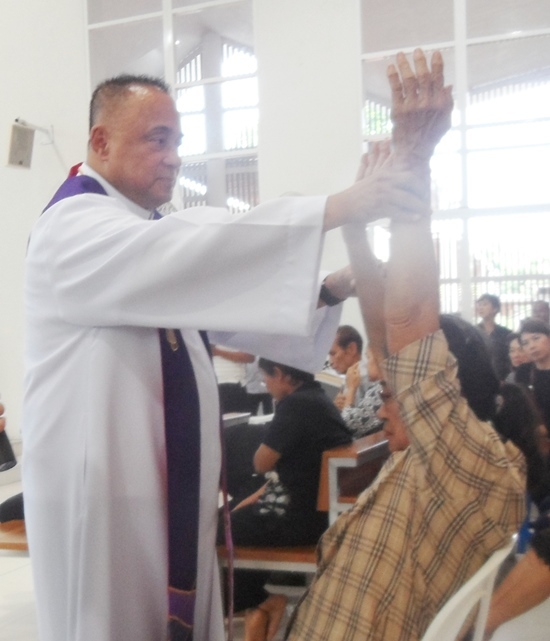 The priest gives patients healing.